After a complete meltdown in Toronto last night, it appeared that someone had given the Wizards the glue stick on the flight back to D.C last night, as the Wizards again glued together a solid effort from all 5 starters, and great bench play on both sides of the ball. Otto Porter played one of the best games dating back to last season and led the Wizards with 29 points. Wizards Head Coach talked about the importance of a total team effort and the key with Otto playing well tonight. 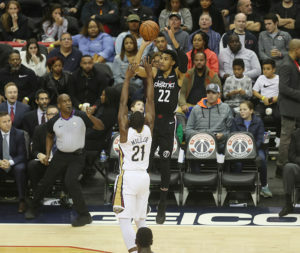 Austin Rivers had 12 of his 18 points in the fourth quarter for the Wizards, who shot a season-high 56.7 percent (51 of 90) from the floor in a game between the league’s second- and third-worst defenses entering Saturday. For the Wizards the record setting night of horrendous proportions last night in Toronto just went away with the effort tonight, but can they keep this up for more than two games and get back to .500 before the middle of December? Players seem to think so. ” We just have to keep going hard at it like we did tonight and forget what happened the previous night and good things will happen,” said John Wall. The Wizards shot 56.7 percent (51-for-90) from the field, the team’s highest clip of the season. 56.7 percent was the Wizards’ highest percentage in a game since shooting 57.6 percent against the Hawks on 1/27/18. Washington is now 30-6 (.833) in the Scott Brooks era when shooting 50 percent-or-higher in a home game.